Two goals from striker Andy Kirk went some of the way to banishing Hearts’ painful memories of two heavy defeats in the past week as they recorded their first-ever league victory over Livingston. Having conceded 10 goals in their previous two matches, against Rangers and Motherwell, Northern Ireland striker Kirk eased their pain with a clinical brace. The youngster put Hearts ahead after only four minutes when he latched on to a neat through-ball from Kevin McKenna and left the visitors’ defence for dead. Keeping his composure, Kirk rounded Javier Sanchez Broto in the Livingston goal and coolly rolled the ball into the empty net. What followed was a rollercoaster match in which both sides created numerous chances to claim all three points. After scoring twice in the 4-3 defeat by Rangers in midweek, in-form striker Rolando Zarate brought Livingston level in 64 minutes. From an in-swinging Barry Wilson corner-kick, Zarate rose to bullet a powerful header into the roof of Roddy McKenzie’s net. Kirk, however, was to have the last word and settled the issue from the penalty spot in the 69th minute. Hearts’ top scorer Mark De Vries had been little in evidence throughout the match but made a telling contribution when he embarked on a solo run which might have ended in a goal for the striker had not Oscar Rubio hauled him down inside the box. Kirk, again showing steady nerves, sent Sanchez Broto the wrong way from the spot. In an uneven match at Tynecastle either side could have come out on top. Indeed, Wilson had the ball in the net for Livingston after eight minutes but his celebrations were cut short by the offside flag. At the other end Jean-Louis Valois, who was to prove a thorn in Livingston’s side all day, shot just wide of Sanchez Broto’s upright from 20 yards with the keeper rooted to the spot. Goalscorer Zarate came close with a free-kick from the edge of the box in 33 minutes but watched as his shot seared agonisingly over the crossbar. Hearts responded when Kevin McKenna sent a looping header wide of Sanchez Broto’s goal following another excellent Valois delivery. In the second half Livingston dominated the early stages as they hunted for an equaliser and Marvin Andrews could have brought them level with a header from a Wilson cross but McKenzie guided the ball wide. In the closing stages substitute Cherif Toure-Maman had a double opportunity to steal a point for the visitors but drove right-footed efforts wide on two separate occasions from inside the box. De Vries set up both Neil Macfarlane and Graham Weir in the dying moments of the match but neither could beat Sanchez Broto. 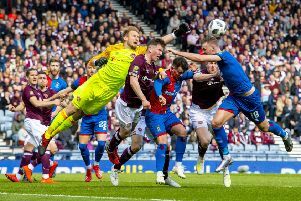 However, Hearts were not to need the security of a third goal. Hearts: McKenzie, Maybury, McKenna, Webster (Janczyk 30), McCann, Wales (Hamill 70), Severin, MacFarlane, Valois, de Vries, Kirk (Weir 86). Subs Not Used: Gordon, McMullan. Livingston: Broto, Hart, Andrews, Rubio, Bahoken, Quino, O’Brien (Xausa 45), Makel (Toure-Maman 77), Wilson, Zarate, Bingham (Camacho 77). Subs Not Used: McEwan, Greacen.